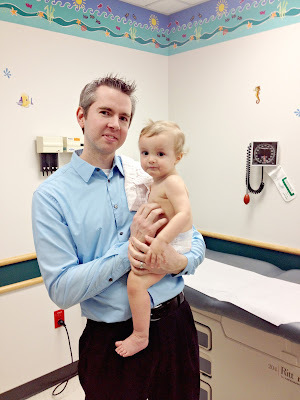 Earlier this month, Eli had an appointment with his Urologist. 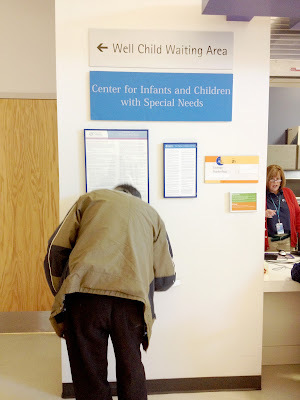 Our pediatrician had some concerns from our last check up that, worst case scenario, would involve a pretty terrible surgery, and lots of long term care. We were a nervous wreck. So, once again, we found ourselves gearing up for a full day at Children's hospital for a day of testing and praying for yet another miracle! Such a big boy sitting in the chair! I really hate this room Daddy! Can't thye leave my kidneys alone already?! Fortunately, the scheduling department was able to get us in for an appointment later that same day to go over the results of the testing. We greeted by the Urologist with a smile (which is ALWAYS a good sign!). He was happy to report that the condition of Eli's kidney's are not getting any worse, and that there was no additional swelling!! Woohoo! Eli has developed a cyst on one of his kidneys however, the doctor doesn't see any need to treat it at this point. Things have been really quiet around the blog. Truth is, we haven't had much energy to write lately. Not because of lack of things to write about but, because life has just worn us down. Eli has been incredibly sick for months now. We have seen our pediatrician more times since the start of the year than many people see their doctors in years. Eli's fevers have been as high as 107.6. We have been to the hospital, seen specialists, had countless tests done, and are still left guessing what is wrong with him. After meeting with Eli's doctor again today, they have recommended for Eli to have his tonsils removed. We can't get into the ENT until Saturday and are wondering how we are going to continue caring for Eli while still going to work. When Eli is this sick, it also makes it difficult to get him to wear his braces. We worry so much that these illnesses are going to cause his bilateral clubfeet to need surgery again. It feels like we are always walking a double edged sword. We are completely emotionally, mentally, and physically exhausted. It is times like this that I am reminded what an amazing man I am married to, and have been blown away from the support we have from our friends. We are so thankful for each of you who have prayed on our behalf, sent texts checking on Eli, brought food, or who are crazy enough to answer the phone when I call or text in tears :) You guys are amazing. So, for all you prayin' people :), we are asking for prayers for strength, sleep for us and more importantly, Eli, and for wisdom for our doctors. There is nothing we want more than for Eli to be restored to health. Our hearts break as we watch our baby suffer so much. This blog was inspired by our son who was diagnosed with bilateral clubfoot. It's the story of how we deal with the fear, doubt, and uncertainty that comes with having a child with clubfoot. What to Buy for a Baby with Clubfoot? The End of An Era: Saying Goodbye to Daily Bracing!